Minnesota United’s home opener is less than a week away. For the team, the staff, and the fans, there’s a lot of preparation going into Saturday afternoon. It’s an exciting and busy week for everyone. Thanks to the stadium’s completion on schedule, the club has had over a month to practice elements of the gameday experience with much smaller groups in soft opening events. The Brew Hall has poured bear and the team shop has sold merch. Some of the security theater has been rehearsed. Fans have found their seats, stood in the Wonderwall, and trialed ways of getting to and from the stadium. The team has kicked a ball on the turf and changed in the locker rooms. Despite all of these trials, the only safe prediction for opening day is that things will go wrong. I regret to inform you that demand for the pub nachos might exceed their supply. Or the best beers will be kicked before halftime. Or a payment system will have an outage, or a gate will be slow to admit fans, or a scanner won’t read mobile tickets correctly. Just hopefully a railing doesn’t fall off and concuss someone. But something will happen, and fans should above-all be patient, plan ahead with plenty of time, and expect the occasional inconvenience. That goes double for transportation. While all of the other stadium gameday logistics are functionally the same as what happens at any of the other major sports facilities in the metro, the logistics of getting fans to and from this game will be unique. Never before have 20,000 people attempted to arrive and depart Midway at the same time. We are all going to learn some things about transportation planning this coming weekend. There’s been a low simmer of discussion about transportation at the Midway site for a long time. This site covered the issue back in 2015, and again in 2016. Our own Wes Burdine wrote a great Twitter thread about the topic. Recently, the subject has been picked up in the popular press, with the predictable focus on parking and traffic. As the game approaches, I wanted to revisit the issue and provide a summary of what we do know about getting to Allianz Field, and perhaps explain some of the logistical solutions that are being planned. 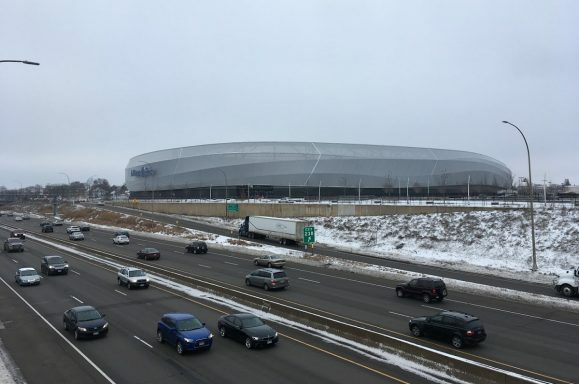 The location of Allianz Field is perfect in many ways; halfway between both downtowns, with a light rail line, a highway, and a rapid bus each on three of its sides, and in a moonscape of strip malls ripe for redevelopment. But it is also a fundamental gamble. All other sports teams play in the downtowns or in the University area, which are both designed to handle event crowds. But the Loons have landed their spaceship at a location surrounded by ordinary city neighborhoods. This is a good thing. When you design an area to handle infrequent, massive events, the area suffers. Think about downtown east during the Metrodome days, when there was a blast crater of parking lots for half a mile in any direction. Sure, fans could park near the stadium, but a massive part of downtown, the most valuable real estate in the city, was lobotomized for most of the hours of the day, for most of the days of the year. It was like that for decades. Thankfully, city leaders and planners are building a new model. While unfortunately tax-exempt themselves, US Bank Stadium and (to a lesser extent) Target Field, are surrounded by taxbase-building properties that house people and offices throughout the year, and not parking structures or lots that remain lifeless for the rest of time. On a smaller scale, CHS Field has pushed the envelope further, nestling into an existing neighborhood and doing no violence to its surroundings. Allianz Field is the next step. The city of St. Paul has prepared a transportation plan that is shaped by the neighborhood, instead of trying to shape the neighborhood to these seventeen-a-year events. The plan relies upon a truly “multi-modal” mix of options. More than half of fans are expected to get to the stadium via walking, biking, or transit. Over a quarter are expected to take shuttles from bars and the parking lots at the state fair. Just under a fifth are expected to actually drive to the stadium vicinity and park somewhere. It’s no surprise that on the eve of the game, we are hearing again the classic concerns of traffic and parking. Neighbors are concerned about street parking being scarce, and about masses of cars crawling through their tree-lined residential blocks. I have some firsthand experience with this topic. Back in the day, I used to live on 4th Street SE, under a mile from TCF Bank Stadium, when the Vikings played there. On gamedays, I could hear the first down horn from indoors. My small little neighborhood also played a small role in the logistics of the stadium. Although my street was a dead-end, fans would park up and down it on gamedays. Because only one of my housemates owned a car, and because we drove it infrequently, we even allowed people to park in our driveway and in front of it. The entire experience occurred eight times that fall and winter, for about four hours each. For the entire 99.63% of the year, parking on our block was easy and traffic was extremely light. The key thing to always keep in mind about traffic and parking is that they are inversely correlated. The less parking is an issue, the greater a problem traffic will be, and vice versa. This is pretty obvious if you think about it. Consider a scenario in which Minnesota United had surrounded their stadium with massive parking garages, making it really easy for everyone to drive to the stadium and park. That would certainly relieve street parking pressure from the surrounding neighborhoods. But with thousands of cars all trying to leave just a couple garages at once, traffic would clearly be a nightmare! Instead, the team is taking the opposite approach, providing little guaranteed parking nearby to the stadium, and encouraging fans to take alternative modes to the stadium. This is likely to result in more people parking within the neighborhoods surrounding the stadium. But it will lead to less traffic, as fewer people drive overall. If you are planning to drive: first consider driving to the State Fairgrounds, and taking a shuttle. If you have lots of time to spare and/or want to tailgate, that’s your best option. If you want to park super close, and you have the money to spend, there are plenty of spots available in the surrounding strip malls that will likely be available, presumably at an event price. You will want to arrive early. For fans looking to drive in nearer to gametime, plan on parking on a local street and walking from there. Don’t let anyone shame you for this, the street is public property. As a Macalester graduate, I can recommend the neighborhood north of the college as a place where street parking is abundant, in large part because few students own cars. But why would you want to drive? Driving is costly, boring, destroying the planet, and limits your choice of beverage at the match. 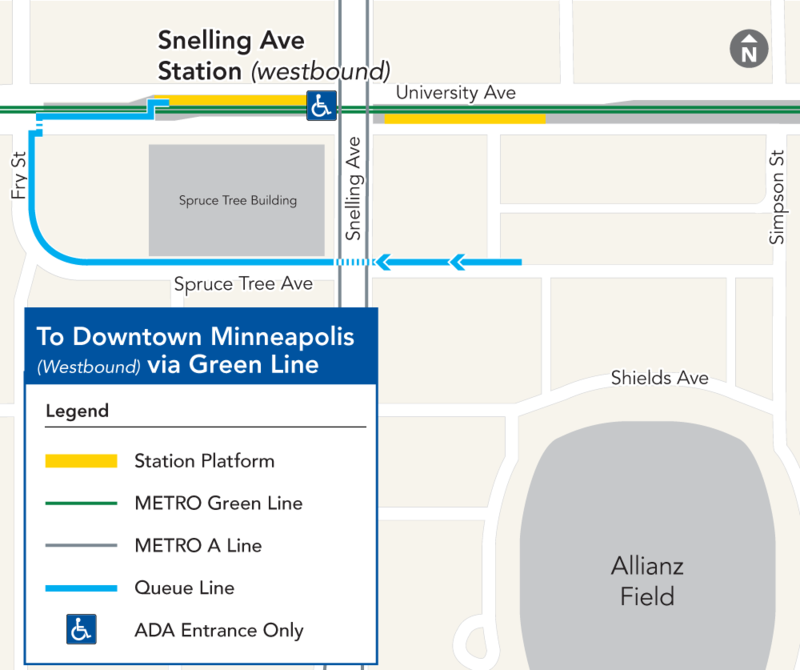 Allianz Field isn’t in a downtown, where dozens of transit routes converge, but it’s at maybe the next best location, served by the Green Line light rail, the A Line rapid bus, and in the future the B Line rapid bus as well (now the well-used #21). The city’s transportation plan estimates 6,300 fans will arrive by train, and 1,200 by A Line rapid bus. Skeptical? Consider just how space efficient public transit is. On the Green Line, Metro Transit uses the Siemens S70 light rail vehicle, which has a capacity of 200 people per car. At normal hours, Metro Transit runs three car trains, meaning that every train has a capacity of 600 people. Trains come every ten minutes, meaning that six trains arrive every hour in each direction, for twelve trains total. That gives us a maximum capacity of 7,200 people per hour at the Snelling Avenue station, or 114% of the estimated total fan demand for rail transit. Transit also scales incredibly well. If on Saturday it turns out that fan demand for the train is beyond these expectations, it is comparatively easy for the agency to simply run another couple buses or trains for matchday. The most challenging aspect of the transit equation might be managing the lines of people waiting to board. But Metro Transit has experience with this from numerous games at TCF Bank Stadium and US Bank Stadium. The transportation plan calls for fans headed westbound to queue on Spruce Tree Drive, and fans headed eastbound to queue along the road just east of Big Top. With good signage, hopefully this issue will fall into order fairly quickly. Many fans will likely mix and match their modes, perhaps by driving to the train or bus, parking near a station, and getting on. That’s a popular tactic for fans headed to Vikings and Twins games, and highly recommended here as well, if you don’t already live within walking distance to transit. If you are planning to take transit: Plot out your route beforehand, and maybe even practice this week if you are unfamiliar with the service you are planning on taking. If you use a GoTo Card, make sure your balance has enough for the trip. Consider taking advantage of the fact that a transit operator is driving by arriving an hour plus before the match and hitting up the Brew Hall or a local bar. The more people who come early, the less crowded the trains and buses immediately before the match will be. St. Paul is not the world’s greatest bike city, and Midway is not the greatest bike neighborhood. The main issues are the major arterial streets that you need to cross, especially Snelling and University. That said, there are a couple of good routes that will take you to the stadium. People on bikes coming from Minneapolis would be smart to get on the Midtown Greenway, take it all the way to the end, and then cross into St. Paul at the Lake/Marshall Bridge. From there, head up the famed Marshall hill, and take a left onto Prior Ave. Cross the highway and take a right onto the bollard-protected cycletrack on St. Anthony, which will take you near to the stadium, with a short jog onto Pierce St. and then Shields Ave.
People on bikes coming from points east in St. Paul might be better advised to take W Minnehaha Ave, and then arrive at the corner of the Allianz Field block via Hamline Ave. People on bikes might also prefer the bucolic Summit Avenue bike lanes, but keep in mind that there is no easy or safe way to get from Summit to the stadium. It might be prudent to take local streets and walk carefully with your bike to cross Selby (which is the end point of Ayd Mill Road), and cross the highway on what will surely be a busy Snelling or Pascal Ave. If you are planning on bicycling: there are about 400 bike parking stalls at the stadium. If you wear a helmet, the club has said that they will be allowed through security. 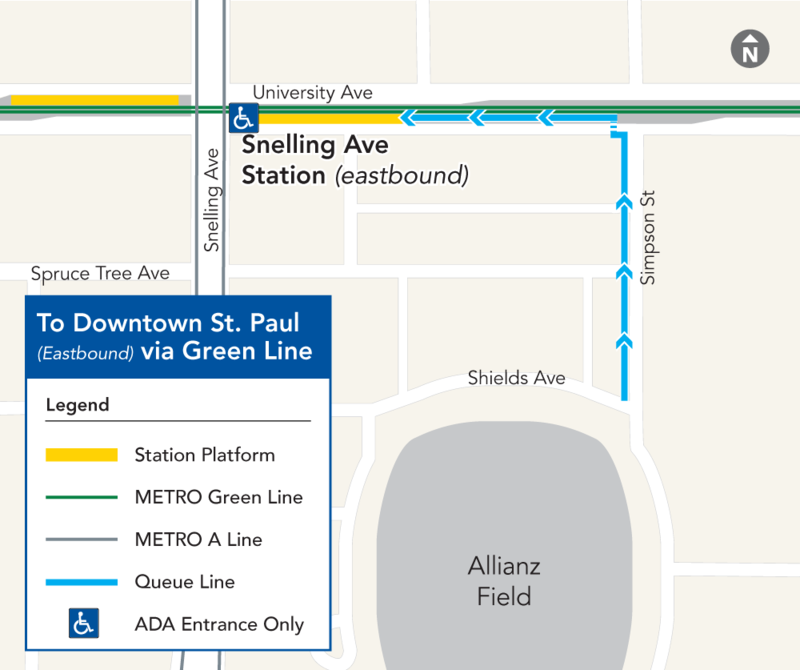 There is some more good information on transportation to the stadium in the Star Tribune and Pioneer Press. But the best advice for opening day is the same. (1) Make a plan, (2) Get there early, (3) Leave there late. Read through these articles and figure out how you plan to reach the game ahead of time. Discuss it with anyone you’ll be going to the game with, and make sure you have what you need in terms of passes. If you plan on arriving via a mode of transport you are not familiar with in your day-to-day, why not take an evening this week and practice? Then, think about getting to the match at least an hour ahead of the scheduled 4:00 PM kickoff. If you haven’t been in the stadium before, this will give you a perfect time to walk around and take it all in. If you want to get something to eat or drink before the match, you can use that hour to hit up the incredible-sounding food and drink options inside and outside of the stadium (eating early might also be smart, don’t expect every vendor to have the right amounts of food to meet the demand on the first day). Finally, this match will be on national television, and it’s a big chance for Minnesota to make a good first impression. The more people who are in the building when the match starts, and the fewer who are waiting outside in lines, the better that impression will be. Finally, if you don’t have something urgent to do after the match, consider lingering around the area. Head to a local bar or restaurant in Midway or Mac-Groveland or run some errands at Whole Foods, Cub, Target, or Ax-Man Surplus. If it’s amenable to you, pulling yourself out of the stream of people exiting the area all at once would help. It’s important to remember two things. The first is, as I’ve written above, this is a neighborhood, not a purpose built events center. It makes sense to have the latter use adapt to the former, even if it might cause some issues. Second, this is the first time that this event will occur. There are going to be hiccups. But over the coming home matches, they will get ironed out. For the opener, the key is patience. Take note of what the issues are, and let the club know where you see things that can be improved. But also keep in mind that it’s never going to be as new and confusing and chaotic and unpracticed as it will be on Saturday.